BEFORE YOU BOOK: I rent Saturday to Saturday..
Want to rent starting or ending on a different day? Contact me before you book by clicking "Ask Owner a Question" button to send me a message with your dates. I'll let you know if I can accommodate you within 24 hours. I am on Central Standard Time. Once you book your vacation, I will contact you by phone or email to confirm your reservation details. Anna Maria Island is the First Barrier Island south of Tampa Bay. Bradenton Beach is at the south end of the Island. To the west, The Gulf of Mexico offers miles of spectacular, uninterrupted sugar sand beaches and emerald waters. To the east, Anna Maria Sound, a mangrove lined bay, has calm docking and mooring areas, a municipal pier, boat launches, nature trails and the Florida Intracoastal Waterway. Bradenton Beach is just an hour's drive from Tampa International Airport. The Sarasota/Bradenton Airport is sixteen miles to the east. Interstate 75 is forty minutes away. Access from the mainland, to the east (Bradenton) is by bridges on Cortez Road W (Rte 684) or Manatee Avenue W (Rte 64). From the south (Longboat Key) via the bridge over Longboat Pass. The Island is seven miles long and only a few blocks wide, providing the sounds and feel of the water wherever you are. The condo has been completely renovated - even some walls were moved. The floors in the bedrooms are carpeted, the rest is 18 inch Italian Terra Rosa porcelain tile. Panel doors, over-sized baseboards and trim, recessed lighting and faux wall finishes contribute to the British-Colonial inspired decor. Gulf View is located directly on the Gulf of Mexico, at the west end of Historic Bridge Street. it is an oasis - a quiet, peaceful, comfortable space where you can relax and rejuvenate. The open-concept living-dining area has two bamboo framed upholstered love seats, swivel barrel chairs so you can enjoy the sunsets, an entertainment center stocked with books, board games and a 42' Hi-Definition TV and DVD player. There is a variable speed ceiling fan. Sliding glass doors open to a screened-in balcony, overlooking the beach, which provides Gulf breezes, the sound of the surf, spectacular views of the water and each evening a beautiful and unique sunset. Watch the diving pelicans and, if you are lucky, catch a glimpse of a dolphin. The dining area has a rattan glass topped table with six chairs. There is a pass-thru bar to the kitchen. The chandelier has a dimmer switch - for your mood lighting. The kitchen was gutted and reconfigured. The wall between the kitchen and the dining room was raised with a pass-thru bar. Short upper cabinets with see-thru glass on both sides were installed over the bar. All new cabinets, appliances and counter tops were installed throughout. There is an east facing window with a top-down, bottom-up pleated shade enabling you to get light from the top while otherwise having total privacy. The kitchen is gourmet equipped with dishes, flatware, pots, pans, bake-ware, utensils and small appliances. Whether you want a cup of coffee, freshly squeezed orange juice or a full gourmet meal, whatever you need is there!. The master bedroom has direct access to the balcony. A Cafe Au Lait color wicker bedroom suite has a king-size bed with a premium mattress, dresser and two night stands. There is a 37' HD TV, a DVD Player, a large walk-in closet with custom organizers, a variable speed ceiling fan and an en-suite bath. Since #101 is an end unit, the second bedroom does not have windows on the catwalk. There is complete privacy. A south facing, outside wall window has a room darkening, top-down bottom/up custom shade. Outfitted with a white wicker suite, two twins beds with premium mattresses, a night stand, chest of drawers and dresser. It is decorated with beautiful linens, has a variable-speed ceiling fan and a wall-to-wall organized closet. The tub/shower full bath is one step from the bedroom door. Both bathrooms have adult height vanities, handicapped height toilets, full width/height mirrors, exhaust fans and recessed lighting. Each has all new fixtures and was decorated to co-ordinate with its adjacent bedroom. The vanities have ample room with drawers and under-sink storage. 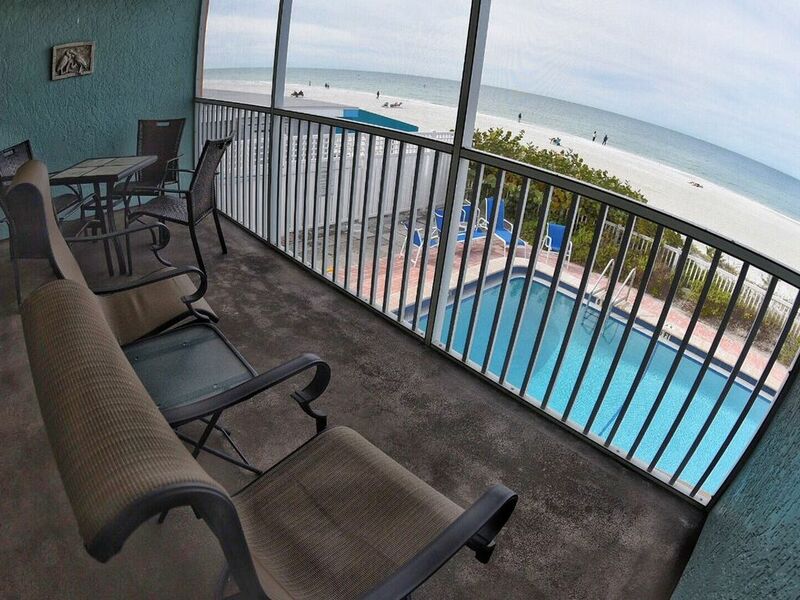 The screened-in balcony, which is directly on the Gulf of Mexico, runs across the front of the condo.. It is furnished with a table and four chairs; two mesh, hi-back swivel rockers and a side table. There are two ceiling fans. You have an unparalleled view of the Gulf of Mexico and a front row seat for the nightly show at sunset. There is an in-unit full sized washer and dryer. The unit has its own central air conditioner and furnace with thermostat that you can set to your comfort level. The keyless entry door has a separate all wood louvered screen door with a lock. You can enjoy cross ventilation with security and complete privacy. This is a secured building with a key-pad entry door. There are two assigned parking spots under the building. Free Wi-Fi. Anna Maria Island provides a daily free trolley that runs every 20 minutes from 6:00 a.m. to 10:30 p.m. from the Anna Maria City Pier on the north to Coquina Beach on the south. Trolleys offer both air conditioned and open-air seating. The trolley stop is in front of the building. A convenience grocery store is directly across the street. A Supermarket, (Publix), is about 7 minutes north - it is reachable by trolley as are most restaurants and shops on the island. You also have the option of ordering online and having your groceries delivered to your door. There are ten restaurants and two premium ice cream shops within a few blocks walk of the condo. No need for a car. Beach chairs, umbrella, toys and rafts are provided. There is parasailing, jet-skiing, yoga on the beach and many other activities nearby. Get in the car and drive a short distance to golf, theaters, malls, botanic gardens, art galleries and more. Shopping at Armands Circle. Art fairs and community special events happening all the time. One block to public fishing pier. Nearby attractions include Ringling Museum of Art, Selby Botanical Gardens, Disney World, Epcot, and Sea World to name a few. I can be reached at sft929@ameritech.net for any questions. I would be happy to help you in any way I can with your plans. Bathrooms have been totally renovated with Decorator Finishes. Custom, Adult Height Vanities with Full Width Mirrors and Countertops. Recessed Lighting. Self-Closing Drawers and Ample Under-Sink Storage. Handicapped Height Toilets. Exhaust Fans. Directly on the Gulf of Mexico. Balcony overlooks white, sugar sand Gulf Beach. New Phones. Cordless with Answering Machine. In-Unit Central Air. With Thermostat You Can Set to Your Own Comfort Level. All Bed Linens Provided - Extra Blankets and Pillows are In the Unit. Yes!!! Beach Towels Are Also Provided. Directly on Gulf of Mexico. Sliding Doors to Covered, Screened Balcony. Dishes - Brand New Service for Eight. Complete Set of Bar and Everyday Glasses. Flatware - Service for Twelve. All Kitchen Utensils - Spatulas, Wooden Spoons, etc. Everything You Need!! Completely Remodeled Gourmet Kitchen. You Can Gaze At The Water While You Squeeze Your Orange Juice. If You Choose to Cook Dinner or Just Have a Morning Coffee, Everything You Need Is There. Two (2) DVD Players. Each Television has Its Own DVD Player. All Types of Books. Hard Cover and Paper Back. Something for Everyone!! Covered, Screened-In Balcony Directly on Gulf of Mexico. Outdoor 42 in. Dining Table and Four (4) chairs. Chaise Lounge. Two Ceiling Fans. Patio Adjacent to Pool. Right on the Beach!!! Surrounded by a Fence for Your Privacy. New Dining Tables and Chairs. Beach Chairs, Umbrella. Rafts, Noodles, Frisbee, Toys etc. Provided in Private Storage Unit in Garage Area. Keys Provided at Check-In. Newly Resurfaced, Heated Pool, Surrounded by Decorative Fence for Privacy. Directly on the White Sand Beach of the Gulf of Mexico. Brand New Chairs, Chaise Lounges and Side Tables. Outdoor Shower. Great spot to wile away your time in one of the most beautiful places in the world. Love the convenience to all the Bridge Street activities and the ability to view the sunsets right from our balcony. The unit itself gives you a very homey feel and we always feel right at home here. You can see the ocean as soon as you open the door. It did not have as many amenities as all the other places we have stayed so we just went out and spent about $50 for extra things like coffee bag, toilet paper, dish washer soap, etc. We were there for two weeks so we thought we would need more than one roll of TP. Also no bath soap. We also bought a couple of rolls of paper towels. We loved the balcony that ran from the living room to the master bedroom. Every place we wanted to go was within walking distance or just across the street. You could heard music from other buildings but it stopped at 10 PM. It was the most comfortable place we have ever stayed. very good first impression a lot of knick knacks around and a tree so it made it look better but it was hard to actually live in. But we made it work and we love staying there beautiful view beautiful sunsets.. This was our second time staying here. The location is great, morning walks down the beach to the public park area and good eats and drink options within walking distance. I think this end of the island is less crowded. The pool and beach are great and the sunsets are even better. If you want something simple and nice, this is it. This condo is in a prime location-right on the beach and easy walking distance to restaurants & shops. It is pet-friendly, which was nice for our 2 small dogs. It's convenient to have beach towels & washer/dryer in the condo. The condo itself could use some updating. There was peeling wallpaper in the bathroom and black crud around the shower. The furniture in the living room is not very clean or comfortable. On the other hand, the bed in the MB is comfortable & the kitchen has all the necessities. There are plenty of books to read in your down time. We came during Red Tide, so the beaches were nearly empty. Honestly, though, the Red Tide was not significant & by Tuesday, the water was clear. AMI is a pretty little island with personable restaurant owners & some pretty fantastic food. (French Table is a must visit!) We also took our bikes and there is a bike lane that stretches from AMI across Longboat Key & at least to St Armand's (which is where we stopped), giving riders a scenic ride. Relaxing vacation in a quiet spot.